Kit Cavanagh was a bit of a wild child and as a teenager and, when her behaviour became too much for her mother, went to live with an aunt who ran a public house in Dublin. She was married with two young children when one day her husband failed to return home. Kit assumed he had been murdered but in fact he had been tricked into joining the army and was fighting in Flanders. Rather than accepting their shared fate, Kit decided that she would go off and find him. She cut off her hair and dressed herself in one of her husband’s old suits and joined the army herself, calling herself Christopher Welsh. Kit was involved in many battles and wounded several times. As her troop moved across Europe Kit would ask if anyone knew of her husband, though to protect her identity as a woman she said she was looking for her brother. She was very good at protecting her identity and her comrades believed her to be a dashing young dragoon. So convincing was her disguise that in one town a woman accused her of fathering her child. She didn’t find her husband and at the end of the war Kit returned home but soon joined up again! After the Battle of Blenheim Kit did, at last, find her husband Richard. Unfortunately, he was in the arms of another woman. It was even more unfortunate for the other woman, as Kit attacked her and cut off her nose. Even though she had found Richard, which was the reason she joined the army in the first place, Kit continued to serve as a soldier until she was injured and taken to hospital with a fractured skull. It was here that her secret was finally discovered. Once again she determined to stay with the army, this time providing soldiers with food and drink. 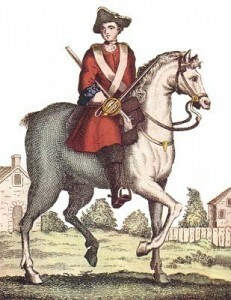 When Richard was killed in battle she married Grenadier Hugh Jones and remained with the army. When he was also killed she, again, remained in the Army until the war ended. In recognition of her service she was given a pension for life. She married for a third time, to another soldier and the two of them ended their days at the Royal Hospital Chelsea. The Royal Hospital’s admissions roll states that a ‘fatt, jolly woman [who] received several wounds in the Service in ye habitt of a man’ was admitted in recognition of her valiant behaviour. When Christian died in 1739, she was buried beside her fellow pensioners and three volleys were fired over her grave.